The Journal Page is made in my Crow About altered book with Christmas images from week 12. I didn’t feel Christmassy at all so I don’t even know why I printed the images, but when I got started gluing I was hooked. The pre-christmas planning is something you can never start too early as you all know, right? I need to sit down and plan what to buy pretty soon! I’m feeling generous and crafty right now, but we’ll see how far that goes… hehe. Anyway, the notebooks, pillows and two year old art prints of three of my collages are available at iHanna’s Etsy right now! The art prints was originally 10$ each, now you can buy all three of them together for 10$! 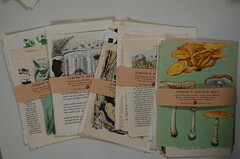 Newest in the shop though is a fun package of vintage bookpages that I think you will like, at least if you’re anything like me. 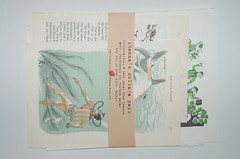 Each pack has 15 Swedish pages with illustrations (!) and it’s dead cheap! 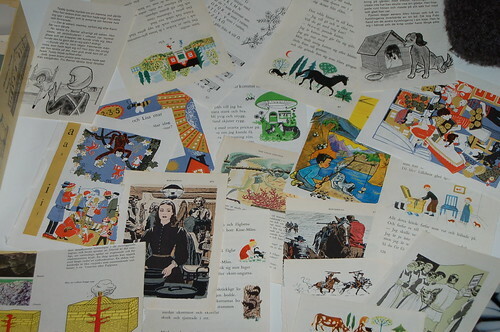 I love all of the illustrations, but I can’t keep all of them or I’ll drown in paper here. I’m keeping my favorites and selling the rest, though those are great too and hopefully will be some of your favorite collage fodder this winter! I can’t link to the Etsy Mini (a view of the shop) in my post here (the code doesn’t work for some reason) but you can always view new items at the sidebar of my blog. It’s been empty for a while because everything expired that was in there, but now I’m adding again. Back on track. I took a screen dump of the shop so that you can see it and get curious… Maybe click your way to it!? I hope so. I’d love if you checked it out. I’m re-doing the header soon too, it’s awefull! I don’t like how it looks and don’t know if I ever did? Can’t remember, but it needs to be cleaner and whiter for December. 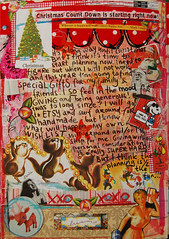 Please link directly to this post, the Collage pack or to my Etsy Shop (ihanna.etsy.com) from your blog or site or even twitter about it (why not), then come back here and send me the link via the contact form before December 1th and I will enter you into a drawing for one of the yummy Collage packs! You’re welcome to use any of the images of the collage pack in your post or just add a text link, either way is fine with me. I’ll enter you into the contest when I’ve checked out your linking. When I was updating my etsy shop I clicked around looking for the Hello Kitty Handbag with polka dot bottom but couldn’t find it! I thought I had I renewed the listing just a week ago because it had expired (items do that when they are not sold after three months), but it was nowhere… I wanted to add it to a category that I just created. Then an e-mail popped in saying it was sold! It’s a great feeling to sell something that you’ve made yourself, and the Hello Kitty bag is my own design that I’m rather proud of (I have one myself that I use every day!). This gave me hope that even when things does not sell at first, they might just be waiting for the right person to click by! Still in the shop is one of the Jeans handbag with blue rose linning thought. I’m curious who will be carrying it around on their shoulder soon. Maybe you? 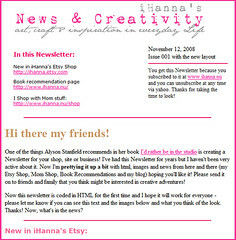 My NewsletterAlso today I’ve sent out my newsletter in html for the first time! I was very nervous about how it would work, but at least I know I got it back looking okay so maybe everyone else did too? If you want to join the newsletter you’ll be one of the first people to know when I update my shop next time. * News & Creativity – about my newsletter where I’ll write about book recommendations, new stuff and links to other fun online stuff! * Today’s News – a sneak peak of what I sent out today, or at least what I wanted it to look like… Didn’t look like that in my yahoo mail account, but not to bad either so I’m not complaining. Do you have a newsletter too? What do you do with it and how often do you send it out? If you know the etsy name of your best friend, check out what they’ve added to their favorite list and maybe that is what you could get for them? My friend Maria has a etsy shop called I Love Betula but no favorite items for me to get her so I’ll have to figure out something else to get her! This entry was posted in Inspiration and tagged crafty business. Bookmark the permalink. I received the newsletter and I like the way you set it up. It looks more your style now. Guess what I found in my mailbox today! Goodies from Sweden!!! I loved everything and Diesel wouldn’t stop smelling the softie and the envelop! I guess she could smell Smilla on them… ;-) You’ve definitely made my day and my week a lot better! I could not resist, ihanna. I just blogged about your giveaway. I don’t like advertising on my blog, but I am really admirative of your work and wanted to share the love with my readers! Maybe someone will get me something adorable from your shoppe! Hanna! Thank you for including my fabric collage in your collection of favorites! I am so happy you like it! 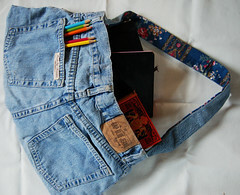 I love your blue jean bag design – will be you be making more? Congrats on your sale. I am waiting for my first one. I just opened my store this week. Looks like fun. I used to make jean purses like yours years ago (1970’s) vest, hats, skirts too. Great fun. Looks like they are coming back. 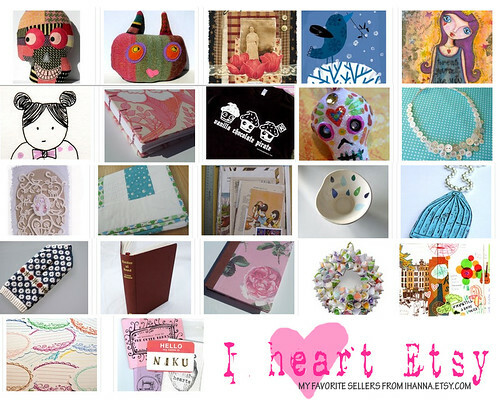 Thankyou for including one of my little creations in your etsy picks! If you were interested in a trade i’m sure I could make use of some more of your book pages- I love confusing my Uni tutors with Swedish text in my drawings! Your handbags are cool. If I didn’t have a freeze on my spending, I’d be over at your shop right now. There are really awesome things there! I just received my prints; and I love them (especially the owl). Gonna put in frame and hang on wall in my room. Thanks heaps!! !